It could be said that I've been looking forward to getting my grubby little hands on Xenoblade/Xenoblade Chronicles for some time. In fact, I've been looking forward to it since at least June 9 of 2010, when I published this post about how it's possible to strip characters down to their skivvies. As some of you may remember, I should have added the European version of this open-world RPG, made by the more-than-able folks at Monolith Soft, to my collection as far back as September of last year. Sadly, the copy that I pre-ordered from sendit.com either was never shipped or was lost while crossing the ocean. 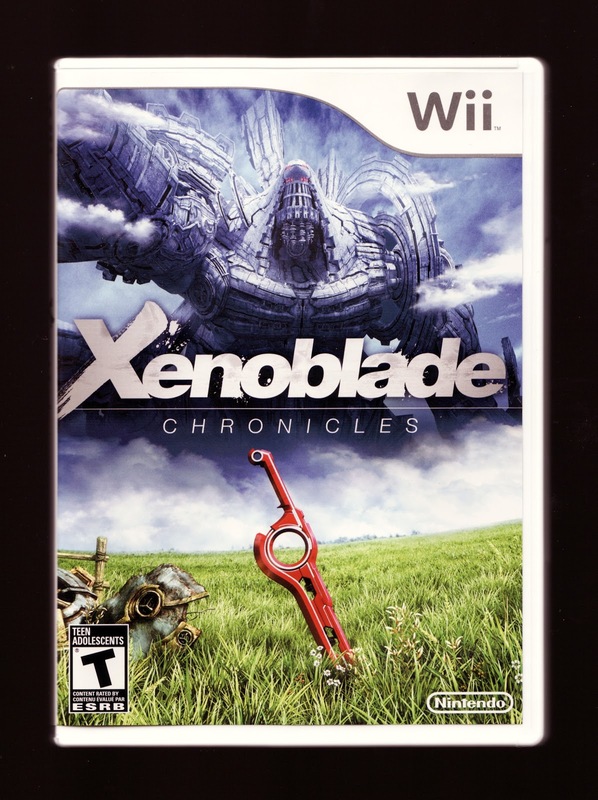 Thankfully, Nintendo of America announced its intention of releasing Xenoblade Chronicles in the US shortly after I gave up on ever receiving said copy. I know this is becoming commonplace in these "Acquisition #123" posts, but I have yet to play my just-acquired (late last week, to be more specific) copy of this game. Oh, I've unwrapped it and spent more time than I should have gazing at its disc (which, I must say, is quite pretty) and manual, but I haven't popped the darn thing into my Wii yet. I plan on doing just that this weekend, though, so expect a slew of (hopefully positive) Xenoblade Chronicles-centric pots in the coming days and weeks. In the meantime, why don't those of you who also added this game to your collections tell me what you think about it? I just bought mine on Sunday! And...it's still in the shrink wrap. That's to guarantee that I'll finish what I'm playing now before I start it. And what am I playing now? I'm FINALLY playing Final Fantasy VII. For the first time. So far? Pretty good. The graphics for SURE aged like hell...but other than that, it's been fun. I hope you are enjoying it as much as me. I think it's the best JRPG since Persona 4, and that's high praise indeed. I'm 50 hours in and my friend tells me I'm only halfway through. It's a long game! I didn't know you were getting this, Justin! It'll be interesting to hear what you think of it. I'm very much looking forward to sinking my teeth into it this weekend. As for FF VII: Man, I haven't played it in AGES! May have to do so soon. I have to say that I like IV, V and VI better, though. I got it last week. I think I've played about 30 minutes so far. Just enough to get to the first town. It's really...dry. It looks like FFXII; not at all sci-fi like the other Xeno games. The battle system seems kinda clumsy. Hopefully I just need to get used to it. I'm going to force myself through more of it soon; but for some reason I'd rather be emulating SNES games on my PC right now. I'm plugging away at it. But Just Cause 2 is REALLY eating my life. It's the stupidest, most ridiculous, insane, over-the-top game I've ever played. And that makes it SO fun. Jump out of a flaming helicopter and grappling hook onto the helicopter that shot you out of the sky, kicking its pilot out and stealing it as your own before being shot out of the sky with a SAM and skydiving into traffic where you steal a motorcycle and immediately lose control of it and crash into a tree, killing yourself? Pure gold. It's the only one I'm missing from the trilogy. Waiting to get the limited edition at a decent price. Have you seen the pics of Pandora's Tower on my blog? Ah, the long, hard road to acquiring a copy of Xenoblade Chronicles is finally a success! Now you actually get to play it :) Can't wait to hear what you think! This is definitely on my "to buy" list, but I just haven't gotten around to it. I know everyone loves it but I'm not particularly enamored with the gameplay style... So many RPGs I've got prioritized right now. We'll see, maybe if you love it, I'll find myself more eager to get it! I wasn't enamoured by the gameplay style either, it looked very like FFXII which is a game with a battle system I found made the game very boring and made me loathe it. 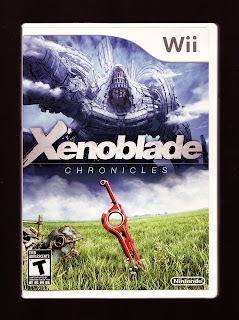 Xenoblade Chronicles however takes everything wrong with that battle system and makes it work brilliantly. I just started the game this evening, and I am currently enjoying it. Not seeing the big deal about the soundtrack so far, though. Nothing memorable. Just looking at the comments here, I think it was wrong of Monolithsoft to name it Xenoblade - it causes confusion with the Xenosaga games, and this games has no connection to those games. I think something like the Monado or referencing that would've been more appropriate. And how can anyone say the music is not memorable? There are some brilliant pieces in the game! The Gaur Plains is my favourite. There's also this jazz like piano (with some oohs) that plays during certain dramatic scenes. I think I spent close to 110 hours in the game. The combat system takes a little while to get to grips with but it works really nicely! Especially once you work out the combo system (you can chain combos if you use the right abilities). Also certain characters if controlled directly (not AI controlled) make you play like a god!! There are same amazing abilities if you know how to use them. Forgot to add that I love the british cast. I was prepared to hate the voice acting and have the game permanently in japanese, but I left it on english through the whole game (sometimes I would switch to japanese just to hear what their voices were like and for a laugh during gem crafting). warp: Well, I've definitely read you need to get through the first few hours of Xenoblade before it really impresses -- pretty much like any/all RPGs these days, right? Anyway, I hope you start enjoying it soon. I'll, of course, let you know what I think of it as soon as I play it. Justin: Is it wrong that I've never even heard of Just Cause 2? How many PS3 games do you have now, BTW? It seems like you have a TON already! Hey there, Phillip! Glad to hear you're enjoying the game so far. As for the soundtrack: Maybe it gets better later on? I'll help as best I can. I'll just add: I'm a turn based fan - I wants more of it!! Personally I think it's great that you've never heard of Just Cause 2. I'm sure it's a fine game for what it is, but I'm so tired of sandbox games. And I'm not just being glib, I did actually play the demo. Eh...ten? I think? Its nice, because the first iterations of lots of series games are REALLY cheap used, and since Blue Ray discs are nearly impossible to scratch, they're all pretty much mint. So...as far as games go, I haven't spent more than $20 on any of them except Skyrim. Just Cause 2 isn't usually my kind of game, to be honest, but my friend JEff and I played it at his house for 6 hours straight without even realizing it because it was so dang fun. So...I bought it. And I'm loving it. Groan, I just checked in on animenewsnetwork's forums about Xenoblade, and it sounds like the reason this game feels so clunky to me is that I'm not using the Classic Controller. The idea of buying this controller for one game is bugging the hell out of me. And no, the Gamecube controller does not work. BTW, you really have me looking forward to *hearing* this game, Igor. I've heard great things overall about its soundtrack! warp: I've heard that, too -- that the Classic Controller is the way to go for Xenoblade. I don't have one, though, and I don't plan to get one anytime soon, so I guess I'll trudge through with the regular ol' Wii remote and nunchuck. Am curious why nunchuk+wiimote feels clunky to most people?? I started the game with nunchuk+wiimote combo. I tried the classic controller, but hated it so went back to the pair. I much prefered using the pair over the classic controller. I find it easier to have the nunchuk+wiimote, as its easier to rest my hands on my lap when playing. Also I got used to the controls by using the pair first (I also heard that people reckon classic is better, so that's when I tried it, but I just found it felt clunky to me) - so I wouldn't worry too much if you don't have the classic controller. I don't understand the aversion to using the nunchuk+wiimote? Though funnily enough I found it easier to play The Last Story with the classic controller! I'm such a nerd, I've already ordered a Classic Controller from a seller on Amazon. $19 (including shipping). At least if Xenoblade doesn't work out, I can use it for Last Story. Or maybe I'll even like Muramasa with it? There's a compatiblity list on Wikipedia if you're curious. It seemed like the main problem I was having was constantly having to adjust the camera -- and it just feels weird when I do that with the nunchuk. They also threw a lot of battle system instructions at me all at once, and it was hard to grasp it all. Oh and my AI companion was constantly running off and fighting things without me. Yea took me a while to get to grips with camera. On nunchuk if you press C it swings camera to face the same way the character is facing (holding C down you can zoom in/out and move the camera around). Pressing Z will target a creature, holding Z and using the dpad (left/right) will allow you to cycle through targets. Perhaps you had something else targeted warp? I know I've done that before, sometimes its hard to make out which creature is closer to you (I've targeted creatures that are standing behind the group I meant to target and I would call 2 groups LOL). I still don't believe its the fault of the controller. It's just a matter of getting to grips with the controls. Once I got comfortable with the controls, I found it quite easy to target and move the camera during combat. I also suggest zooming the camera out a bit before starting combat, then you'll see more around you (even moving the camera up a bit above you). Well, that's a relief to hear, Igor -- that you thought the remote + nunchuck combo felt good to you. I'm not usually picky about such things, so I wasn't all that worried, but it's still nice to know going into the game. warp: I have a feeling this is one of those situations where some folks prefer the remote + nunchuck and others prefer the Classic Controller, don't you think? I own too many controllers already, so I'm going to avoid buying a Classic Controller until I consider it absolutely necessary. Thanks for all of this info, Igor. I really appreciate it, and I'm sure others here do, too! Funny thing is, Just Cause 2 AND FFVII, the two games I'm playing right now, are both Square games. Granted, FFVII is Squaresoft from back in the day, but Just Cause 2 is Square Enix. I consider Just Cause 2 more of an Eidos game. Square Enix + Eidos = Squidix. Whoops, I just realized I never replied to you, Bryan! Sorry about that! But yeah, the faux MMO-style gameplay doesn't usually appeal to me, but it's good to hear that it improves on what FFXII did, because I really couldn't get into that. I'll definitely give this one a go when I get a chance. Right now, though, I've got Pandora's Tower! Oh, you don't have to worry about that, Anne!